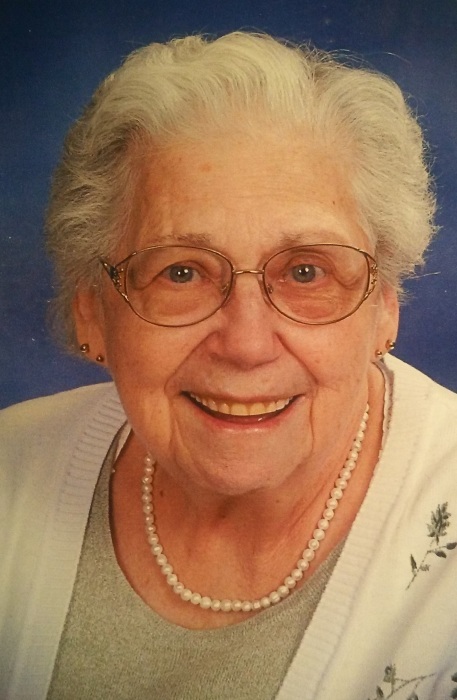 Roszelia Mae Smyers, of Granger, Indiana passed away Saturday, March 23, 2019. She had lived in La Porte most of her life. Roszelia was born January 20, 1926 in Hebron, Indiana to Ray and Matilda (Garvey) Flynn. On April 27, 1946 in Wellsboro, Indiana Roszelia married Walter Smyers who preceded her in death on December 16, 1996. Roszelia was employed with the former McClellans Dime Store and Schafer Dry Cleaning in La Porte. She was a member of LaPorte V.F.W. Auxiliary #1130. Roszelia leaves behind a son, Harry C. “Chuck” (Beckey) Smyers of Granger, Indiana; nine grandchildren; many great-grandchildren; many great-great-grandchildren; and many nieces and nephews. She was preceded in death by her parents; husband, Walter; a son, Walter David Smyers; a sister Helen Cites; two brothers, David Flynn and Lester Flynn; a half-sister, Margaret Coyle, a half-brother, John Clinger; and a granddaughter. A graveside service will be at 1 p.m. (CST), Tuesday, March 26, 2019 at Pine Lake Cemetery. The officiant will be Rosemary Ware. Frank L. Keszei Funeral Home, Essling Chapel, 1117 Indiana Avenue, La Porte, Indiana is in charge of arrangements. In lieu of flowers memorial contributions may be made to Heartland Hospice, 230 W. Catalpa Drive, Mishawaka, Indiana 46545. Please share prayers, condolences and memories at Essling Funeral Home.com.